SPIRAX SARCO® Pilot Operated Pressure Regulator is a self-actuated pilot-operated pressure regulator. 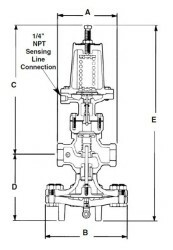 Downstream pressure is fed back through an external sensing line to the pressure pilot, which adjusts the opening of the main valve so as to maintain the set pressure. The main valve can close tight for ANSI/FCI 70-2 Class IV shut off when steam is not required.